1. Preheat oven to 325° F.
2. Season the short ribs generously with salt & pepper. 3. Put the thyme, rosemary and bay leaves between the two halves of the celery stalk and tie into a bundle with twine. 4. 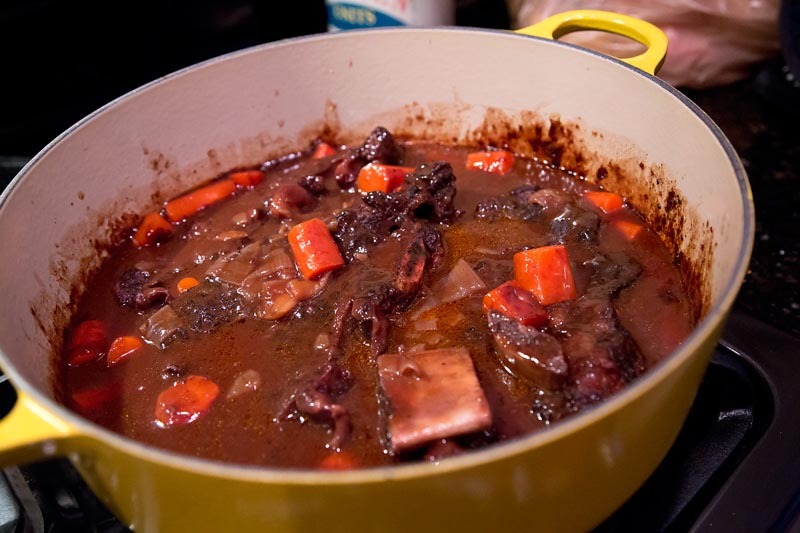 Heat the oil in a large Dutch oven over high heat until the oil starts to smoke, then brown the short ribs well. You will probably have to do that in two batches. Be sure to pour off most of the fat between batches. 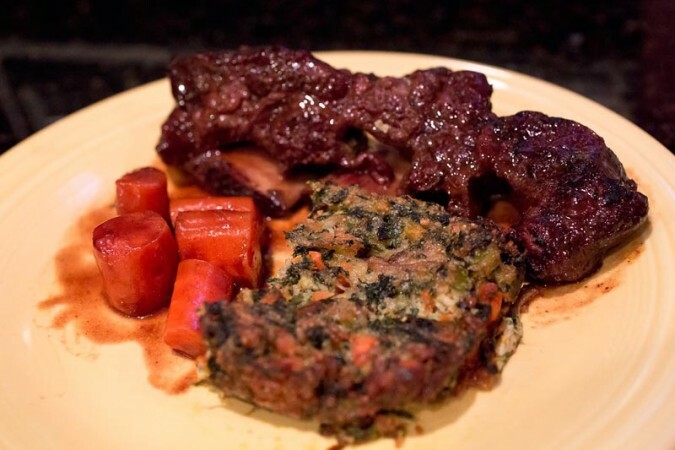 Remove the short ribs and set aside on a plate. Optionally, you can brown the short ribs over a charcoal fire instead of the Dutch oven to add a smoky note to the dish. That’s what I usually do. 5. Lower the flame to medium and add the tomato paste, cooking for a few minutes until it mellows out and mixes with the oil. Add the onion, the 1” carrot pieces, shallots and garlic to the Dutch oven and sauté until the onion softens and starts to brown slightly. 6. Add the flour and stir well to combine. Cook the flour for two minutes, constantly stirring; add the wine and the celery herb bundle. Raise the heat back to high and cook until the liquid is reduced by a third (20 – 25 minutes). 7. Return the short ribs to the pot, stacking in two layers, if necessary. Add the stock, optional prunes and a little salt (about a teaspoon). Be sure short ribs are completely covered by the stock. If not, add enough water to cover. Bring to a simmer, cover the Dutch oven and transfer to the oven for three hours. 8. At the one hour mark, add the potatoes to the Dutch oven and continue to cook. The short ribs are done when the meat is fork tender and falling off the bone. 9. Transfer the ribs and potatoes to a platter, and then strain the braising liquid through a sieve or fine mesh strainer. Discard the solids. Skim the fat from the braising liquid and return it to the cleaned Dutch oven or a medium saucepan. 10. Bring the liquid to a strong simmer and reduce by a little more than half (approx. 1 hour). Add the optional ¾” carrots at the 20 minute mark. Return the short ribs and potatoes to the pot and simmer for 10 minutes to reheat for service.